The answer is a six-letter word. Here's an attempt at a text version, but you're really better off looking at the picture. To get a full tour, you must be a man of many faces and blend into all the right spots. I'll use a different spoiler for each level of solving the puzzle, such that you can read only as far as you want to be spoiled, if you want to only look at the first few steps for hints. Note that there is some Mathematica code further down, which is not inside a spoiler tag. The "full tour" indicates that we need to traverse every cell of the grid. It's likely that we need to traverse each cell exactly once, hence asking for a Hamiltonian path. The arrows indicate the start and end of the path. The "man of many faces" probably just indicates that faces of a (six-sided) die play a role. "Blend into all the right spots" means that we somehow need to match up the faces with the grid cells. The puzzle asks us to place a six-sided die on the bottom left cell, and roll it around the grid, such that we visit each cell exactly once. 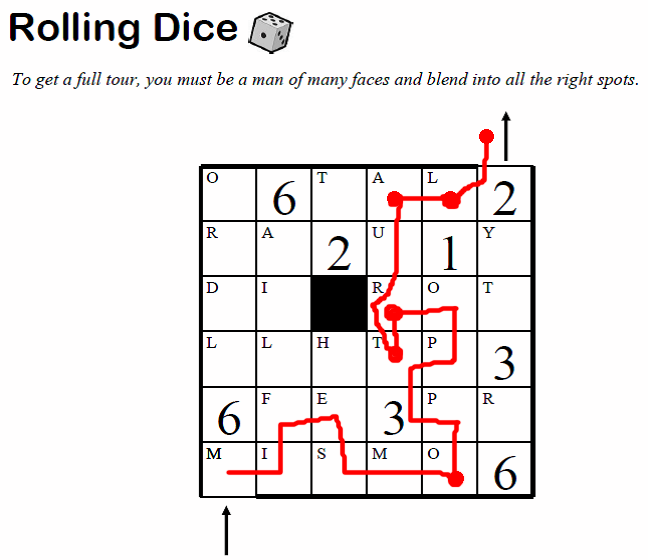 Furthermore, whenever the die is on top of a number, the top face has to show that same number. To simplify the search for the path, I started at the end, because there are only 4 possible die orientations with a 2 on top. 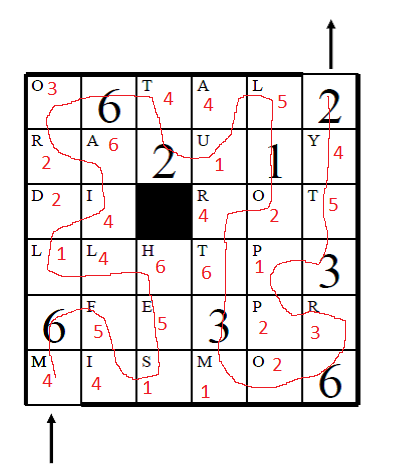 If we now pick out the letters in that path where each number is on the top face (see red letters in the image), we get 6 words. In order from 1 to 6 they are SLUMP, DROOP, OR, MILITARY, FELT, HAT. "to slump" and "to droop" are synonyms for "to slouch", but "a slouch" can also be a military felt hat. Hence the solution is slouch. Whenever you land on a square, if there is a number next to it (either touching a side or a corner), then you may move that many squares. Starting at M, there is a 6 next to it, so I moved 6 squares to O. There is a 6 next to the O, so I moved 6 squares to R. There is a 2 and a 1 next to the R, so I chose 1 and moved 1 square to T. There is a 3 next to the T, so I moved 3 squares to the A. There is a 2 and a 1 next to the A, so I chose 1 and moved 1 square to the L. There is a 1 and a 2 next to the L, so I chose 2 and moved 2 squares out of the grid. I landed on M, O, R, T, A, and L, which spells MORTAL. Not the answer you're looking for? Browse other questions tagged word dice or ask your own question.